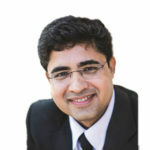 Pramoda, U. Gupta, I. Ahmad, R. Kumar, C.N.R. Rao, Assemblies of Covalently Cross-linked Nanosheets of MoS2 and of MoS2-RGO: Synthesis and Novel Properties, Journal of Materials Chemistry A, 4, 2016, 8989. Shagufta, I. Ahmad, Recent insight into the biological activities of synthetic xanthone derivatives, European Journal of Medicinal Chemistry, 116, 2016, 267. Ahmad, Shagufta, Recent Development in Steroidal and Non-steroidal Aromatase Inhibitors for the Chemoprevention of Estrogen dependent Breast Cancer, European Journal of Medicinal Chemistry, 102, 2015, 375. Ahmad, Shagufta, Sulfones: An important class of organic compounds with diverse biological activities, International Journal of Pharmacy and Pharmaceutical Sciences, 7, 3, 2015, 19. Kumar, K. Gopalakrishnan, I. Ahmad, and C. N. R. Rao, BN-Graphene Composites Generated by Covalent Cross-Linking with Organic Linkers, Advanced Functional Materials, 25, 37, 2015, 5910. Kumar, D. Raut, I. Ahmad, U. Ramamurty, T. K. Maji and C. N. R. Rao. Functionality preservation with enhanced mechanical integrity in the nanocomposites of the metal–organic framework, ZIF-8, with BN nanosheets, Materials Horizons, 1, 2014, 513. R. Buchmeiser, I. Ahmad, V. Gurram and P. S. Kumar, Pseudo-Halide and Nitrate Derivatives of Grubbs and Grubbs_Hoveyda Initiators: Some Structural Features Related to the Alternating Ring-Opening Metathesis Copolymerization of Norborn-2-ene with Cyclic Olefins, Macromolecule, 44 (11), 2011, 4098. Ahmad, G. Chapman and K. M. Nicholas, Sulfite-Driven, Oxorhenium-Catalyzed Deoxydehydration of Glycols, Organometallics, 30 (10), 2011, 2810. Vkuturi, G. Chapman, I. Ahmad, K. M. Nicholas, Rhenium-Catalyzed Deoxydehydration of Glycols by Sulfite, Inorganic Chemistry, 49, 2010, 4744. I. Kureshy, I. Ahmad, K. Pathak, N. H. Khan, S. H. R. Abdi, H. C. Bajaj, Solvent- free microwave synthesis of aryloxypropanolamines by ring opening of aryloxy epoxides, Research Letters in Organic Chemistry, 2009, Article ID 109717, doi:10.1155/2009/109717. I. Kureshy, I. Ahmad, K. Pathak, N. H. Khan, S. H. R. Abdi, R. V. Jasra, Sulfonic acid functionalized mesoporous SBA-15 as an efficient and recyclable catalyst for the synthesis of chromenes from chromanols, Catalysis Communications 10, 2009, 572. Pathak, I. Ahmad, S. H. R. Abdi, R. I. Kureshy, N. H. Khan, R. V. Jasra, The synthesis of silica-supported chiral BINOL: Application in Ti-catalyzed asymmetric addition of diethylzinc to aldehydes, Journal of Molecular Catalysis A-Chemical 280, 2008, 106. Kluwer, I. Ahmad, J. N. H. Reek, Improved synthesis of monodentate and bidentate 2- and 3-pyridylphosphines, Tetrahedron Letter 48, 2007, 2999. Pathak, I. Ahmad, S. H. R. Abdi, R. I. Kureshy, N. H. Khan, R. V. Jasra, Oxidative Kinetic Resolution of racemic Secondary Alcohols catalyzed by recyclable Dimeric Mn(III) salen catalysts, Journal of Molecular Catalysis A-Chemical 274, 2007, 120. I. Kureshy, I. Ahmad, N. H. Khan, S. H. R. Abdi, K. Pathak, R. V. Jasra, Easily Recyclable Chiral Polymeric Mn (salen) Complex for Oxidative Kinetic resolution of Racemic Secondary Alcohols, Chirality, 19, 2007, 352. Pathak, A. P. Bhatt, S. H. R. Abdi, R. I. Kureshy, N. H. Khan, I. Ahmad, R. V. Jasra, Enantioselective phenylacetylene addition to aromatic aldehydes and ketones catalyzed by recyclable polymeric Zn(II) salen complex, Chirality, 19, 2007, 1. I. Kureshy, I. Ahmad, N. H. Khan, S. H. R. Abdi, K. Pathak, R. V. Jasra, Chiral Mn (III) salen complexes covalently bonded on modified MCM-41 and SBA-15 as efficient catalysts for enantioselective epoxidation of non- functionalized alkenes, Journal of Catalysis A-Chemical, 238, 2006, 134. Pathak, A. P. Bhatt, S. H. R. Abdi, R. I. Kureshy, N. H. Khan, I. Ahmad, R. V. Jasra Enantioselective addition of diethylzinc to aldehydes using immobilized chiral BINOL-Ti complex on ordered mesoporous silicas, Tetrahedron: Asymmetry,17, 2006, 1506. I. Kureshy, I. Ahmad, N. H. Khan, S. H. R. Abdi, K. Pathak, R. V. Jasra, Encapsulation of chiral MnIII (salen) complex in ordered mesoporous silicas: An approach Towards heterogenizing asymmetric Epoxidation catalysts for non-Functionalized alkenes, Tetrahedron: Asymmetry 16, 2005, 3562. I. Kureshy, I. Ahmad, N. H. Khan, S. H. R. Abdi, S. Singh, P. H. Pandia, R. V. Jasra, New immobilized chiral Mn(III) salen complexes on pyridine N-Oxide Modified MCM-41as effective catalysts for epoxidation of nonfunctionalized Alkenes, Journal of Catalysis A- Chemical 235 , 2005, 28. I. Kureshy, S. Singh, N. H. Khan, S. H. R. Abdi, I. Ahmad, A. Bhatt, R. V. Jasra, Improved catalytic activity of homochiral dimeric cobalt salen hydrolytic kinetic resolution of terminal racemic epoxides, Chirality, 17, 2005, 1. I. Kureshy, S. Singh, N. H. Khan, S. H. R. Abdi , I. Ahmad, .Bhatt, R. V. Jasra, Environment friendly protocol for enantioselective epoxidation of non-functionalized Alkenes catalyzed by recyclable homochiral dimeric Mn(III)salen complexes with hydrogen peroxide and UHP adduct as Oxidants, Catalysis Letters, 107, 2005, 127. I. Kureshy, N. H. Khan, S. H. R. Abdi, I. Ahmad, S. Singh, and R. V. Jasra, Dicationic chiral Mn (III) Salen complex exchange in the interlayers of Montmorillonite clay: a heterogeneous enantioselective catalyst for epoxidation of non-functionalised alkenes, Journal of Catalysis, 221, 2004, 234. I. Kureshy, N. H. Khan, S. H. R. Abdi, S. Singh, I. Ahmad, R. V. Jasra, Catalytic asymmetric epoxidation of non-functionalised alkenes using polymeric Mn(III)Salen as catalysts and NaOCl as oxidant, Journal of Molecular Catalysis A-Chemical, 218, 2004, 141. I. Kureshy, N.H. Khan, S.H. R. Abdi, A. P. Vyas, I. Ahmad, S. Singh, R. V. Jasra, Enantioselective Epoxidation of Non-Functionalised Alkenes catalysed by recyclable new Homo Chiral Dimeric Mn(III) Salen complexes, Journal of Catalysis, 224, 2004, 229. I. Kureshy, N. H. Khan, S. H. R. Abdi, I. Ahmad, S. Singh, and R. V. Jasra, Immobilization of dicationic Mn(III) salen in the interlayers of montmorrillonite Clay for enantioselective epoxidation of non-functionalised alkenes, Catalysis Letters, 91, 2003, 207. Applied Nanotechnology and Nanoscience International Conference (ANNIC), November 9-11, 2016, Barcelona, SPAIN. 2nd International Conference on Smart Material Research (ICSMR), September 22-24, 2016, Istanbul, TURKEY. Emirates Foundation’s Think Science Competition, April 17-19, 2016, World Trade Center, Dubai, UAE. SSL Visiting Fellow 2013-15 at the International Centre for Materials Science, JNCASR, SSL, Bangalore, INDIA. Global Conference on Materials Sciences (GC-MAS-2014), November 13-15, 2014, Antalya, TURKEY. 5th Annual International Workshop on Advanced Material (IWAM 2013), organized by Ras Al Khaimah Center for Advance Materials (RAK CAM), Feb. 24-26, 2013 at Al Hamra Fort Hotel, Ras Al Khaimah, UAE. Internal Quality Assurance in Higher Education Institutions workshop organized by the Commission for Academic Accreditation (CAA)- 2nd May 2011, Alghurair University campus, Dubai, UAE. 45th American Chemical Society (ACS) Midwest Regional meeting, Oct. 27-30, 2010, Wichita, Kansas, USA. 55th Annual American Chemical Society (ACS) PentaSectional Meeting- Biofuel, April 10, 2010, organized by American Chemical Society (ACS), Norman, Oklahoma, USA. 18th International Symposium on Olefin Metathesis and Related Chemistry (ISOM XVIII), Organized by the Leibniz-Institute for Surface modification (IOM), August 2-7, 2009, Leipzig, GERMANY. 16th International Symposium on Homogeneous Catalysis (ISHC-XVI), July 6-11, 2008, Organized by the Institute of Chemistry of Organometallic Compounds (ICCOM) of the Italian Research Council (CNR) held in Florence, ITALY. European IDECAT Summer School on Computational Methods for Catalysis and Materials Science, 15-22 September 2007, Porquerolles, FRANCE. 8th Netherland’s Catalysis and Chemistry Conference (NCCC), March 5-7, 2007, Noordwijkerhout, The NETHERLANDS. 7th International Symposium on Catalysis Applied to Fine Chemicals organized by German Catalysis Society and Dechema. Oct 23-27, 2005, Bingen -Mainz, GERMANY. 1st Indo- German Conference on Catalysis-A Cross Disciplinary Vision, February 6-8, 2003, Indian Institute of Chemical Technology (IICT), Hyderabad, INDIA. The Food and Drug Administration (FDA) has approved several quinazoline derivatives for clinical use as anticancer drugs. These include gefitinib, erlotinib, lapatinib, afatinib, and vandetanib (Fig.1) . Gefitinib (Iressa®) was approved by the FDA in 2003 for the treatment of locally advanced or metastatic non-small-cell lung cancer (NSCLC) in patients after failure of both platinum-based and/or docetaxel chemotherapies. In 2004, erlotinib (Tarceva®) was approved by the FDA for treating NSCLC. Furthermore, in 2005, the FDA approved erlotinib in combination with gemcitabine for treatment of locally advanced, unrespectable, or metastatic pancreatic cancer. Erlotinib acts as a reversible tyrosine kinase inhibitor. Lapatinib (Tykreb®) was approved by the FDA in 2012 for breast cancer treatment. It inhibits the activity of both human epidermal growth factor receptor-2 (HER2/neu) and epidermal growth factor receptor (EGFR) pathways. Vandetanib (Caprelsa®) was approved by the FDA in 2011 for the treatment of metastatic medullary thyroid cancer. It acts as a kinase inhibitor of a number of cell receptors, mainly the vascular endothelial growth factor receptor (VEGFR), EGFR, and rearranged during transfection (RET)-tyrosine kinase (TK). Afatinib (Gilotrif®) was approved by the FDA in 2013 for NSCLC treatment. It acts as an irreversible covalent inhibitor of the receptor tyrosine kinases (RTK) for EGFR and erbB-2 (HER2). Cancer is one of the major causes of worldwide human mortality. A wide range of cytotoxic drugs are available on the market, and several compounds are in different phases of clinical trials. Many studies suggest that these cytotoxic molecules are also associated with different types of adverse side effects; therefore researchers around the globe are involved in the development of more efficient and safer anticancer drugs. 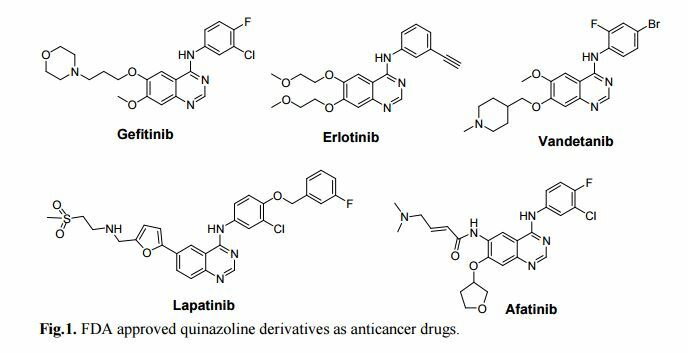 In recent years, quinazoline and its derivatives have been considered as a novel class of cancer chemotherapeutic agents that show promising activity against different tumors. The aim of this article is to comprehensively review and highlight the recent developments concerning the anticancer activity of quinazoline derivatives as well as offer perspectives on the development of novel quinazoline derivatives as anticancer agents in the near future. 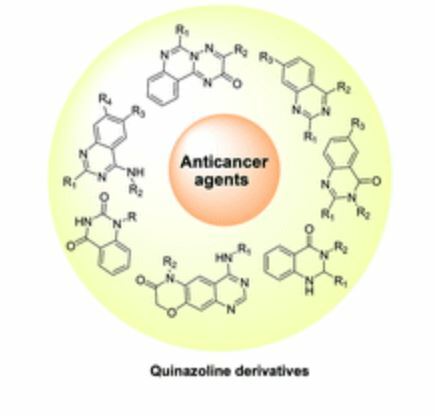 This article reviews the recent advances in the development of quinazoline derivatives as anticancer agents. Dr. Shagufta joined the American University of Ras Al Khaimah as an Assistant Professor of Chemistry in the School of Arts and Sciences in August 2014. 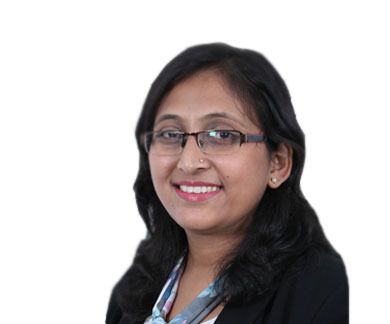 Prior to joining AURAK, Dr. Shagufta worked as an Adjunct Assistant Professor of Chemistry at the University of Modern Sciences, Dubai and American University of Ras Al Khaimah, UAE. Dr. Shagufta also worked as a Postdoctoral Researcher Associate at the Department of Chemistry and Biochemistry, Oklahoma University, USA. She developed the noble drug delivery system for breast cancer drugs using carbon nanotubes and acquired the significant experience in nanotechnology and synthetic organic chemistry. She was appointed as a Postdoctoral Research Fellow and Visiting Scientist at Leiden/Amsterdam Centre for Drug Research (LACDR), Leiden, The Netherlands. Her research interest was In silico prediction and clinical evaluation of the cardiotoxicity of drug candidates. She was focused to identify chemical substructures as ‘chemical alerts’ that interact with this hERG channel. Dr. Shagufta received a Ph.D. under the prestigious CSIR-JRF and SRF research fellowship in Chemistry from Central Drug Research Institute (CDRI)/Lucknow University, India in 2008, her PhD research work was in the field of estrogens and antiestrogens, design and synthesis of steroidal and non-steroidal tissue selective estrogen receptor modulators (SERMs) for breast cancer, 3D-QSAR CoMFA and CoMSIA studies and analysis of pharmaceutical important molecules. Dr. Shagufta has published 20 articles in peer-reviewed International journals of Royal Society of Chemistry, Elsevier, Wiley and Springer. Dr. Shagufta teaches courses such as General chemistry, Organic Chemistry, Chemistry in Everyday Life, and Spectroscopy along with laboratory courses. Organic Chemistry, Medicinal Chemistry focused on Breast Cancer and Osteoporosis, Heterogeneous catalysis and Nanotechnology. Irshad Ahmad and Shagufta. 2015. Recent developments in steroidal and nonsteroidal aromatase inhibitors for the chemoprevention of estrogen-dependent breast cancer. European Journal of Medicinal Chemistry, 102, 375-386. Irshad Ahmad and Shagufta. 2015. Sulfones: An important class of organic compounds with diverse biological activities. International Journal of Pharmacy and Pharmaceutical Sciences, 7 (3), 19-27.